Here’s the story of how this frightened darling little Podenco went from rags to riches! 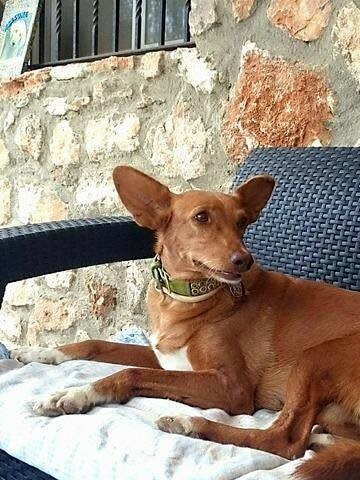 about her when PEPA was involved in another rescue and were alerted that there was a stray injured podenco. Tasha had a….. The shoe box was lying outside our garden gate. Immediately I knew it was one of mine because of the familiar product name on the lid. ‘Strange,’ I thought. ‘How on earth did my shoe box get into the lane?’ Of course, I immediately blamed the dogs! It had to be one of them messing about! Little rascals, they must have pushed it through the railings. After all, it did look a bit crushed. Obviously, a new lesson in the…..
Of course, as we all know, cats never like being confined. So, it was with much trepidation that I chose the largest bedroom for my nine cats to sleep and eat for the first three weeks in their new home. Luckily for me there were few complaints, each cat obviously deciding it was easier to give in, to sleep all day and enjoy a little freedom exploring the house in the evenings after the workmen had left. However, there was….. There is something always exciting about choosing a name for a new pet. For example, when I choose a name I like to be a bit different from the norm and looking back I suppose, to a stranger, I have chosen some rather odd names. Smithy Magoo was one, Lollypop another, Buster-Me-Boy, another and Uncle Jack, a name I chose for a gorgeous white kitten. I don’t know why, but all the names seemed to suit. The screeching of car brakes, a door slamming shut and the sound of a motor car racing away was all I needed to rush down to the lane to see what was going on. When I saw the small, wicker basket lying on its side, the lid tightly closed, I feared the worst. I wasn’t wrong! Inside, were the most beautiful fluffy white bundles I had ever seen. Two tiny heads, four bright blue eyes, stared up at me. ….. I have to admit it was very easy creating the characters for my book, primarily because the characters stem from wonderful memories that I have cherished over the years. One day, in the middle of something I was meant to be doing, I decided to sit down and count the number of cats who have come into my life over the years. It was a lovely experience. Each time I wrote a cat’s name a special memory popped up in…..
My reason for having written Wanted: A Forever Home was to raise lots of money for the animal charity my husband and I founded in Spain in the year 2005, so with every book sold I have promised to give a donation to P.E.P.A. (Protección y Educación para Animales) Registered NIF G97646921.